This special type of agate comes from the Owyhee Mountains that are located in the states of Oregon and Idaho in the USA. Its name comes from its feather like patterns on a transparent background. The colors can vary from white, cream, pink, red, blue and yellow. We could not find anything related to this semi-precious stone. We could not find anything related to this particular agate. 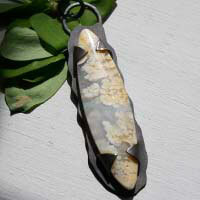 Therefore, you can refer to the healing properties of the agate in general.